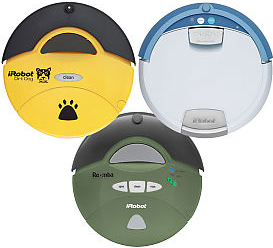 Buy an iRobot Scooba 5900 and get a free iRobot Roomba 401 plus free shipping ($119 value). Save 25% plus free Shipping on the iRobot 3-in-1 Premium Total Cleaning Solution ($219.99 savings). The kit includes: iRobot Dirt Dog, Workshop Robot, iRobot Roomba Scheduler with Intelli-Bin, and iRobot Scooba Floor Washing Robot (model 5900). Free Dirt Dog with purchase of Scooba and Roomba Sage plus free Shipping.